Definition: Arbitration is a type of Alternative Dispute Resolution (ADR). It is a process wherein one or more independent third person, analyses the dispute thoroughly, ascertains the cause of dispute, listens to the parties, i.e. employer and employee, collects relevant facts and information, so as to make recommendations accordingly, that have a binding effect on the parties concerned. Arbitrator: An arbitrator has a position equal to a court judge who is chosen by the parties themselves. He/She is the one who is unbiased and takes final and binding decision on the dispute after hearing both the parties and considering all the facts. It is also known as an arbitral tribunal. Arbitration Agreement: Arbitration is not possible without the free consent of the parties concerned. Hence there must be an agreement in writing between the employer and employee which is to be contained in a document called as an arbitration agreement. The document states that the parties want to resolve their dispute, through the arbitration process. Arbitral Award: The decision taken by the arbitrator or arbitral tribunal on the dispute is known as an arbitral award. Confidentiality: Confidentiality is a significant characteristic of arbitration. Absolute privacy is maintained in the process, i.e. apart from the parties and arbitrator, no one has any idea of the happenings in the process. Furthermore, the sharing of any information or document with any third party is completely prohibited. The decision, i.e. arbitral award is final in nature, and no appeal can be made against it, except in case of parties incapacity, unfair procedure, invalid arbitration agreement and biases of the arbitrator. 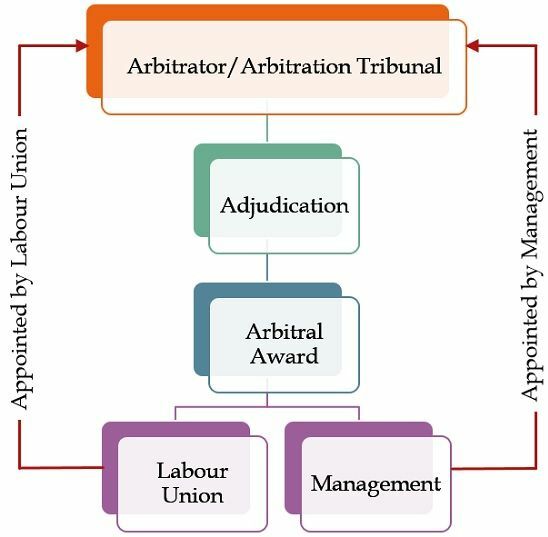 In general, it is the labour union, who initiates the arbitration process and then communicates the same to the company’s management. After that, the company and union jointly select an arbitrator for the process. Once the arbitrator gives his assent, then the time and venue for the arbitration are to be ascertained, and the process begins. The issue under consideration is presented before the arbitrator or the panel of arbitrators as the case may be, in a document. Both the sides present their argument at the time of the hearing. The hearing is the same as the court-proceeding which includes witnesses, legal counsel, evidence and cross-examination. After completion of the hearing, the arbitrator analyses all the relevant information and documents submitted and decides in 30-60 days and also give reasons for the decision in a written document. It is an expensive process. The parties involved must share the cost involved in the process. If a wrong arbitrator is chosen for the process, then the judgement can be random. For better industrial relations, too much arbitration should be avoided. Arbitration is a private legal mechanism for adjudicating disputes, which is arranged by the parties concerned, and the decision rendered by the neutral third person is final and acceptable to both the parties. Further, it is an immediate process, wherein the delays are reduced and settlement is expedited.